To Select, Delete, or Create new player profile, select PROFILE (A). To start or continue your undead adventure, select PLAY (B). To change volume, switch screen sizes, turn custom cursor on or off, or view credits, select OPTIONS (C). 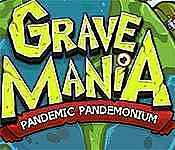 To view a comprehensive guide to the world of Grave Mania: Pandemic Pandemonium, select HOW TO PLAY (D). Select QUIT (E) to leave the game. Starting a game with a new profile will lead you to the Game Mode. Select the difficulty that is right for you. (A)	Relaxed: All timers for Bonnie levels are turned off. Game is paused during station mini-games. (B)	Normal: All timers for Bonnie levels are running. Game is paused during station minigames. (C)	Loca: All timers for Bonnie levels are running. Game continues to run during station mini-games, Left-click on OK to start your adventure or CANCEL to return to the Main Menu.